school | "é rayhahn, rayhahn"
With K heading back to Mizzou on Sunday to start her sophmore year there, I thought it would be an opportune time to flashback to my own college dorm life at Moorhead State University. My first three years were all in room 272 of Nelson Hall, on the second of 11 floors. It was fun living in “The Beer Can”, whose cylindrical hallway was perfect for driving golf balls, throwing a frisbee, or maybe a bowling ball. Room 272 had a clear shot across the building and the elevators in the middle, right at the top of the stairs, so we always had a view of everyone’s comings-and-goings. My sophmore and junior years we had a deck in our room, with the mattresses on the floor and chairs, shelves, and stereo on top. You always had to have a track queued up when someone else let their stereo get a bit too loud; “Carry on Wayward Son” always worked well against “Another One Bites the Dust” for instance. Okay, this photo ID is just plain scary. I’ve blurred the important info on the image to protect the privacy of anyone who might unfortunately look like I did back then…God help them. The primary everyday use this card got during my time at MSU was to gain access to the college cafeteria, located in Kise Commons; “Kise” as it turns out rhymes with “queazy” in a bizzare yet sometimes apropriate twist of fate. In the mid-winter months, after hitting the shower and getting stuff together for the morning classes, we’d trek the block or so from the dorms to Kise, where we’d shake the frost out of our hair after letting the frigid air freeze-dry it. Typical breakfast was OJ, toast, and a bowl of Captain Cocoa Jacks (Captain Crunch/Cocoa Krispies/Apple Jacks). I forget what we’d have for lunch and dinner, but it was edible but oftentimes gristly. The all-you-can-eat setup was a potential disaster for a kid who has grown up in a large household, but after the initial Freshman 15, I plateaued for the last three years. Initially I thought it was neat to see my ID move up the cafeteria checklist as each year/quarter progressed, until I considered that everyone before me either graduated, moved off campus and eats elsewhere, dropped out, transferred, or died (not necessarily from the food). I was right near the top of the first page left column when I finally graduated. I imagine the whole process is all automated with a swipe card now (no, cards back then did not have a magnetic strip), but back in the day it kept some work study students employed. A tip of the (Tums bottle-) cap to you, Kise. They are pretty much good memories, whether or not it is due to the blurring of time. Marty’s Tip for Buffets*: if ice cream or frozen yogurt is being served, you are not required to use the tiny bowls stacked nearby — grab a cereal or salad bowl, or better yet, pile it onto a dinner plate. Forty years ago, Beltrami, MN used to have it’s own elementary school, before it completely merged with the school in Fertile, MN. I was lucky enough to have attended grades 1 through 4 there, the last four years of its existence. 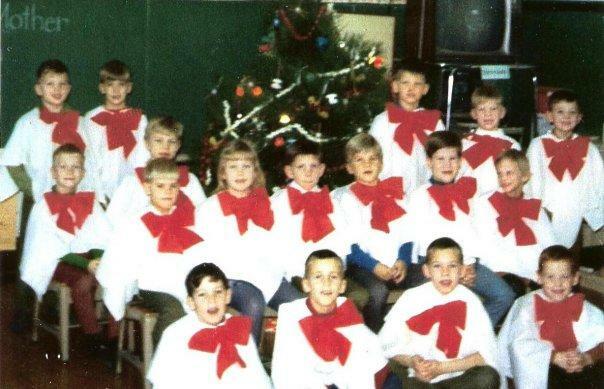 One of the treats for the parents (and for the kids, I guess) was the choir concerts we would perform in the auditorium at various intervals during the school year. Earlier this year, a good friend treated me with the following photo attached to an email. My memory is pretty fuzzy, but I would guess that we weren’t particularly thrilled with the outfits. And yes, that motley bunch represents Mrs. Regedahl’s entire 1st and 2nd grade classes. Have a Merry Christmas, and a safe and healthy New Year. When this blurb came out in the weekly Advocate (or “Badvocate” as it was known), we were pumped — five positions, and five candidates! We also noticed that someone’s handwriting was poor enough that the second F was read as a T in Jack’s last name, but since it would be many years until Homer Simpson’s favorite bartender Moe began answering prank calls on his telephone, it was probably for the better. The election was held, and it was a slam dunk. From what we learned later, at that time an attempt was made to telephone Jack to tell him that he had been elected. He had left no telephone # on his application, so the registrar’s office was contacted. It was only then that it was learned that there was no Jack Knoft registered for classes at MSU. While write-in candidates around campus scrambled to drum up enough votes to try snag the opening in the final election, the guys on 2nd floor Nelson Hall enjoyed a good laugh over it all. A few weeks back I considered that it might be “fun” to help chaperone at band camp again this year — even though K had graduated and I was now an alumni parent. Besides having a surplus of vacation, it provided an entertaining way to spend a week in the woods where the cabins were air conditioned, the food was good and plentiful, and internet access was non-existent. I’d chaperoned three other years (skipping K’s freshman year) so this year would make a nice round four. And, ironically, the next morning K began her summer class at the local community college. Should be a nice way to ease into things before leaving to Mizzou in a couple months.